We’ve written before about studies linking prison nutrition with better outcomes. While saving money seems to be the initial motivation at this point the ripple effect on the inmate’s health and overall behavior and rehabilitation is likely to be quite substantial. Perhaps this is the beginning of a trend. 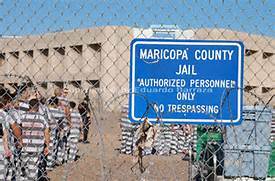 Please note: Sheriff Arpaio is a controversial figure who many consider to be overly harsh in other aspects of running the county jails. We do not condone insensitive treatment of anyone including prisoners. We report here on only an issue of vegetarian concern.